Since its first session in Atlanta in 1905, the United Sacred Harp Musical Association, commonly known as the United Convention, has stood out as more than just an ordinary Sacred Harp singing. The story of the United Convention offers a fascinating perspective on the history of Sacred Harp singing in the twentieth century and beyond. This online exhibition was produced in conjunction with a physical exhibition at the 112th session of the United Convention in Atlanta, Georgia, September 12–13, 2015. Founded at a critical juncture in the history of Sacred Harp, the United Convention sought to serve as a central organization unifying singers from all different communities. Yet by sponsoring and endorsing only one of the competing editions of The Sacred Harp, the United Convention helped solidify the lasting division of Sacred Harp singers into three very different camps. 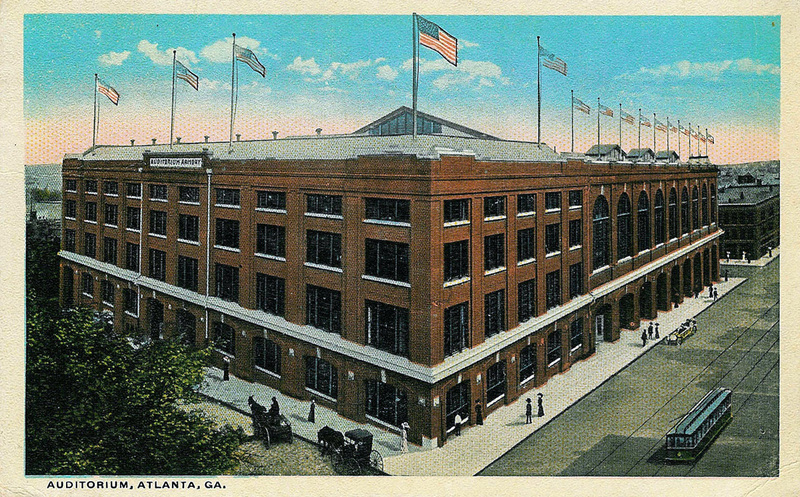 Nonetheless, the United Convention remained an important institution throughout the twentieth century, attracting thousands of Atlanta residents during its fifty-year tenure in the city—before converting into a traveling convention and meeting in dozens of other cities around the Southeast and as far away as Chicago. The return of the United Convention to Atlanta in the twenty-first century seems an apt moment to reflect on this history and celebrate the devoted singers who have maintained this venerable Sacred Harp institution. 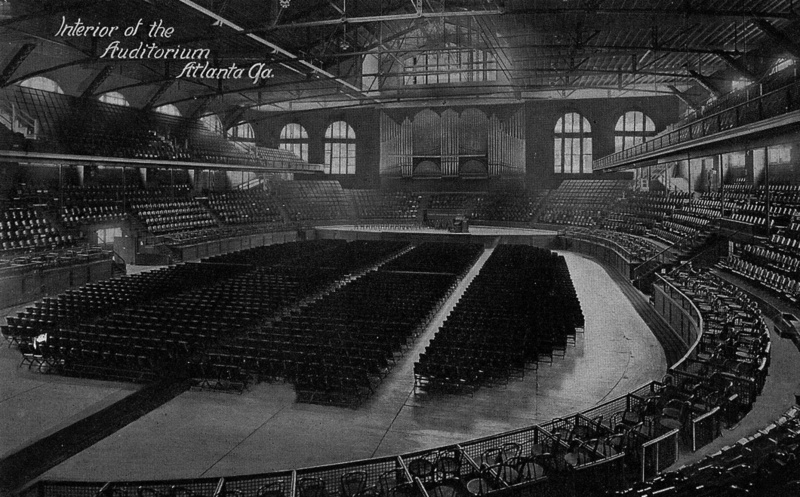 The United Convention met in the Atlanta Municipal Auditorium, often referred to as the Armory, for approximately forty years, beginning in 1913.
by choosing urban, industrial Atlanta as the home for their new convention. The premier “New South” city was the perfect setting to reinforce James’ assertion that Sacred Harp was not merely a backwoods, historical relic, but a vital form of music in the contemporary world. Atlanta’s status as a transport hub also made it a convenient site for Sacred Harp singers to gather from around the Southeast. As many as several hundred singers representing conventions in Georgia, Alabama, and as far away as Texas traveled to the United Convention during its first decades. In addition, sizable crowds came from within the city—newspaper accounts suggest that curious Atlantans helped swell the attendance to well over a thousand. The convention’s proceedings reflect its significance as a civic event. The three days of the early United Conventions included not only singing sessions, but addresses by politicians and religious luminaries, along with other special events. In 1925, for example, Mayor Walter A. Sims and Fulton County Commissioner and future Mayor Isaac Newton Ragsdale each offered the considerable sum of $100 as prize money for the winners of a children’s leading contest. Members of the 1911 class posed for a newspaper photographer. Read a selection of articles that Atlanta newspapers published about the United Convention in its first decades. As the name they selected suggests, the organizers of the United Sacred Harp Musical Association intended the new convention as a unifying force during a time when Sacred Harp singings were organized around discrete regional hubs and were under considerable pressure from other tunebooks and musical styles. Rather than establish unity through compromise and coalition, however, the United’s leadership assertively promoted their own ideal of Sacred Harp. Following the death of Benjamin Franklin White in 1879, co-compiler of the first Sacred Harp, singers promoted divergent visions of the direction that singing from The Sacred Harp should take as gospel songbooks drew increasing support. 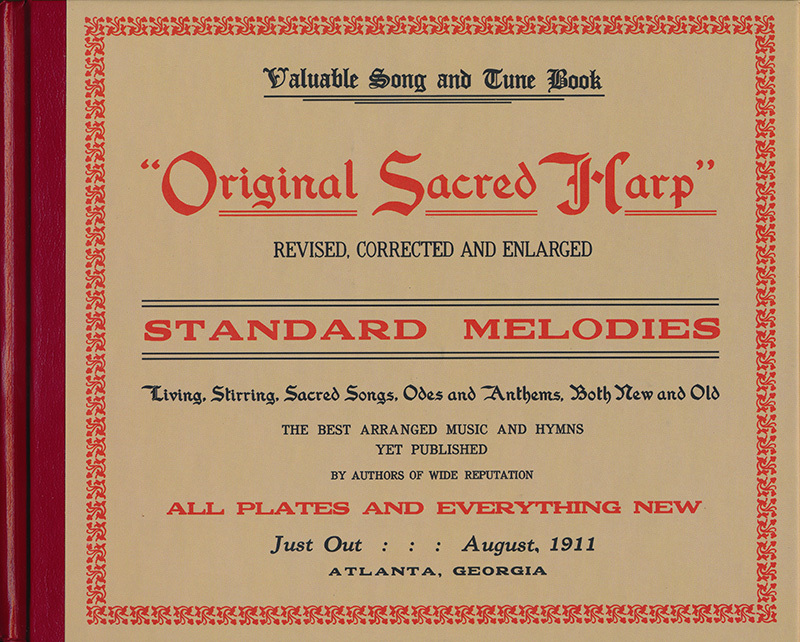 New Sacred Harp revisions reflected these different perspectives in the degree to which they either conformed to the musical aesthetic of the nineteenth century Sacred Harp editions, or introduced more modern music in popular hymnody styles of the early twentieth century. Original Sacred Harp—the “James Book.” The Sacred Harp Publishing Company and Pitts Theology Library published a new centennial edition, edited by Jesse P. Karlsberg, in 2015. By the time the United Convention held its first meeting, Wilson Marion Cooper of Dothan, Alabama, had already published a new revision that was beginning to gain a strong following in south Alabama. The convention issued a call for a rival edition in 1906. In 1909, B. F. White’s son, James Landrum White, a co-founder of the United Convention, responded with a new edition of his father’s book that was even more modernizing. Even after hastily issued revisions in 1910 and 1911 that moderated some of his more extreme changes, White’s efforts were rejected by the United Convention. They elected instead to adopt the Original Sacred Harp, a revision compiled by the convention’s co-founder, Joseph Stephen James. White, who protested that his work was “not even given a chance,” left with a contingent of his supporters and founded their own competing convention. The “James Book” would garner the most support, establishing the lineage of revisions leading up to today’s widely-used Sacred Harp, 1991 Edition, the “Denson Book.” White’s volume also had a lasting impact, however, particularly in the Atlanta area, where a community of singers continues to sing from the “White Book” at Hardeman Primitive Baptist Church in Decatur. The United Convention remained an Atlanta institution for half a century. In the 1950s, however, the convention began traveling to other prominent singing churches. The list of communities that have hosted the United Convention since could serve as a fairly comprehensive almanac of Denson Book territory in the southeast, spanning West Georgia, Northeast Alabama, the Birmingham area, and West Alabama—with three sessions in Nashville. Warren Steel’s online history of the United Sacred Harp Musical Association includes a list of every meeting-place and chairperson since 1936. One of Alan Lomax’s original tapes of the 1959 United Convention, courtesy of the Association for Cultural Equity. Listen to the entire recording, generously made available online. The United Convention achieved a measure of fame in the wake of its 1959 meeting at Corinth Baptist Church in Fyffe, Alabama. Alan Lomax, a renowned musicologist and folklorist, brought a portable recording studio to document the singing. His exceptional recording, which was first issued in 1961 as All Day Singing from the Sacred Harp, helped introduce a nationwide audience to the sound of traditional Sacred Harp. Lomax’s Association for Cultural Equity has recently made the entire recording freely available online, offering singers an unparalleled experience of mid-twentieth century Sacred Harp. Another important project documented the fortieth anniversary of Lomax’s visit—a recording of the 1999 United Convention, held at Liberty Baptist Church in Henagar, Alabama, was released on CD as In Sweetest Union Join. The accompanying liner notes include numerous recollections of the 1959 session, along with photographs documenting the event. 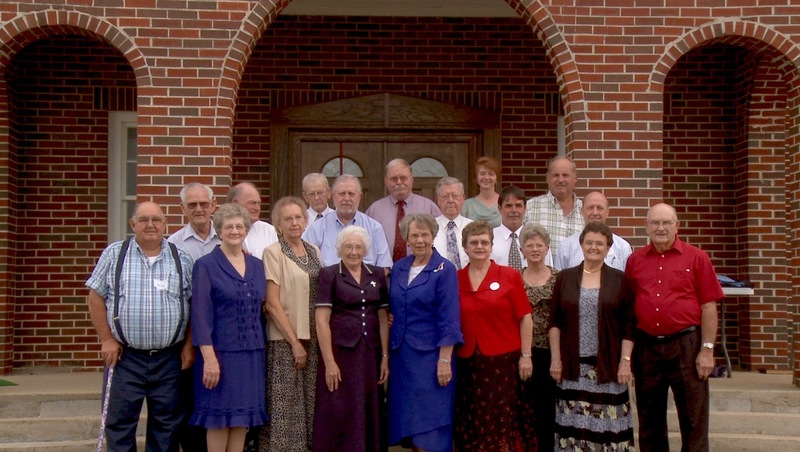 In 2009, the 50th Anniversary of Lomax’s Recording, the United Convention returned to Fyffe, where singers who had been there in 1959 posed for this photo. The 2009 session was a celebration not only of Lomax’s legacy, but of the contributions of all the dedicated singers that have kept Sacred Harp flourishing over the half century since his visit. Watch Colonel Bud Oliver lead “Cusseta” (p. 73t), at the 2009 United Convention. The only time that the United Convention met outside the southeast was the 1990 session, which convened in Chicago, Illinois. Sacred Harp had blossomed in the Midwest in the previous decade, and numerous singers from around the country, including a sizable southern contingent, gathered to celebrate. View a slideshow of photos and other documents from the event, courtesy of Ted Mercer. The Sacred Harp Museum’s collection includes an audio recording of part of the 74th session of the United Convention at Antioch Baptist Church in Ider, Alabama. Listen to the entire recording. The 2013 United Convention at Church of Our Savior in Atlanta. Photo by Jonathon Smith. In the last decades of the twentieth century Sacred Harp singing spread around the United States, and even to the United Kingdom. This growth has only accelerated in the twenty-first century. Regular singings now meet in over twenty countries in Europe, Asia, and Australia. Sacred Harp also continues to flourish in its southern homeland, where singing in southern cities such as at Atlanta have seen a significant revival in recent years. 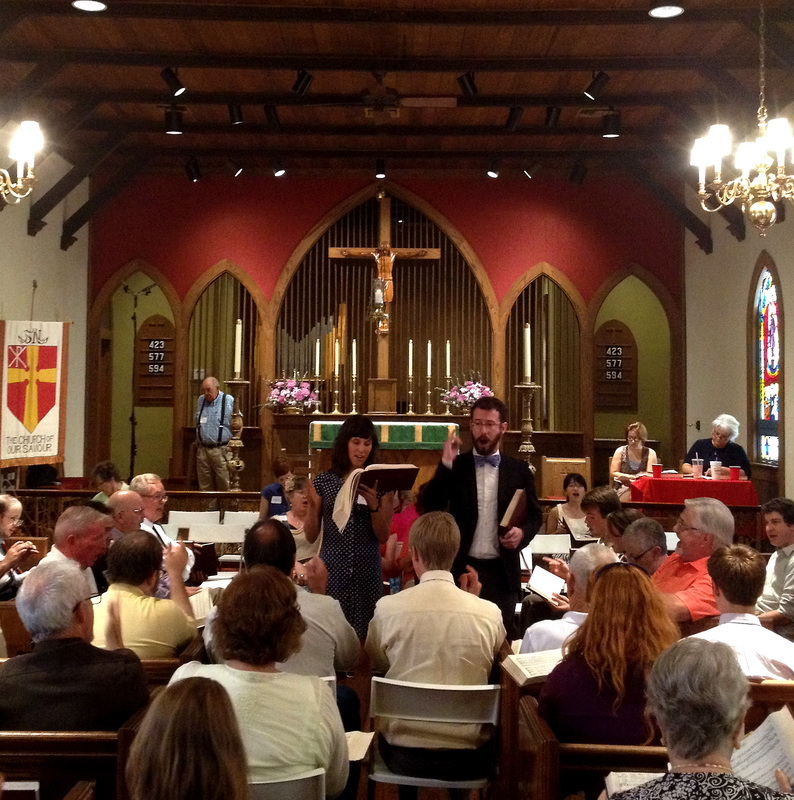 In 2013, the Atlanta Sacred Harp community hosted the 110th session of the United Convention at Church of Our Savior in Virginia Highlands, marking the return of the convention to its original hometown for the first time since 1956. While the crowd was considerably smaller than at the sessions a hundred years ago, it included singers from across the United States and several other countries. Nathan Rees, curator of the Sacred Harp Museum, shows a first edition of The Easy Instructor, 1801, the first book published in shaped notes. At the sixth session of the United Convention in 1909, Vice President C. J. Griggs exhibited an original 1844 copy of The Sacred Harp. 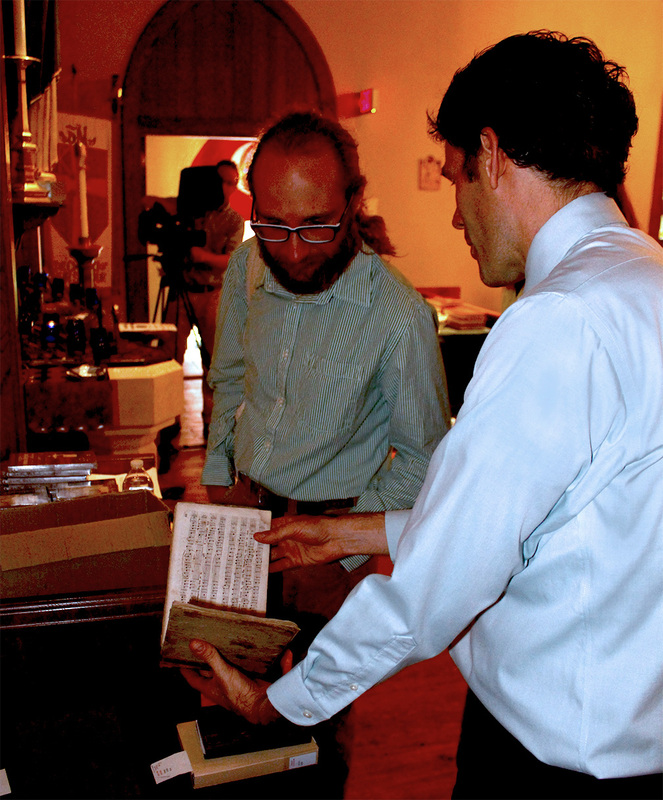 The Sacred Harp Museum continued that tradition at the 2015 session in Atlanta, presenting an exhibition in collaboration with Pitts Theology Library of Emory University. Pat Graham, the library’s director, brought a selection of rare and important books, including volumes published at the authorization of early United Conventions, as well as hymnals dating as far back as the seventeenth century, along with an original music manuscript by preeminent Sacred Harp composer, Marcus Cagle. Although the convention’s complexion has changed considerably over the past century, and it no longer oversees the revision of The Sacred Harp, it remains a special institution to many of its singers. The United Sacred Harp Musical Association still continues the work that its organizers envisioned, uniting Sacred Harp singers from communities across the now international Sacred Harp landscape in harmonious union. We invite you to use the comment box below to add your own recollections of the United Sacred Harp Musical Association. Listen to a complete recording of the 2015 United Convention, held in Atlanta. This exhibition was curated by Nathan Rees. The Sacred Harp Museum committee is comprised of Charlene Wallace, Karen Rollins, Nathan Rees, and Jesse P. Karlsberg. The Sacred Harp Museum wishes to thank Pat Graham and the Pitts Theology Library of Emory University, Nathan Salzburg and the Association for Cultural Equity, Jonathon Smith, and Ted Mercer.